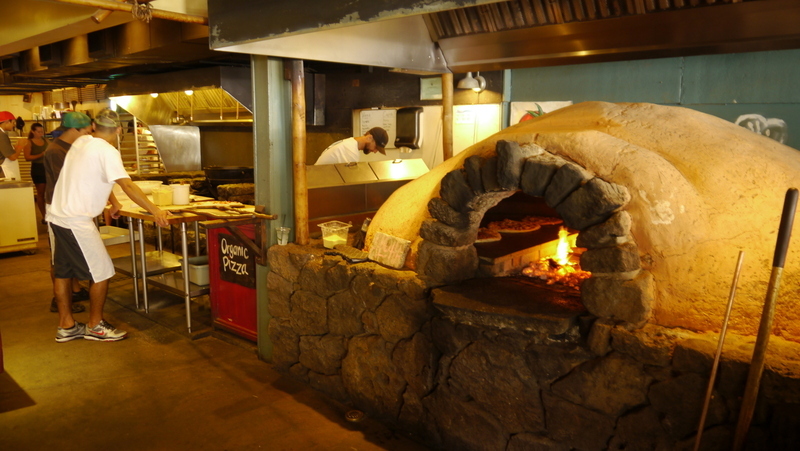 Our Maui dining adventures continues with some Japanese food, a touristy luau, and some organic pizza. 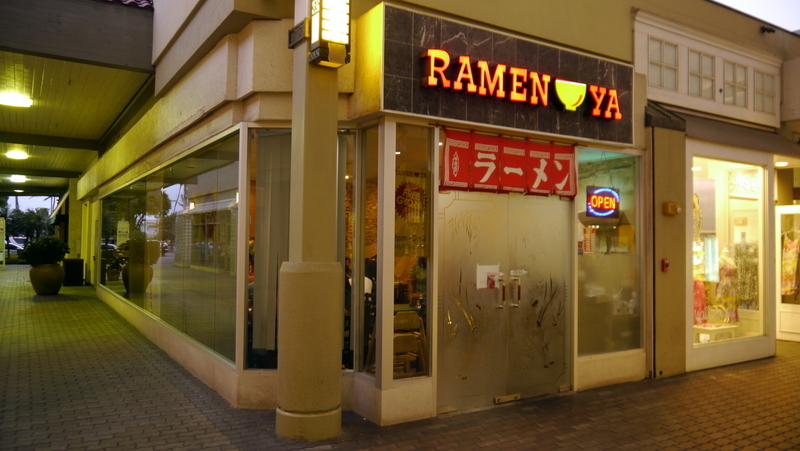 Monday evening we ate dinner at Ramen Ya, a Japanese restaurant located in a mall in Kahului. Right across the courtyard is Sugi’s aunt’s fabric store. 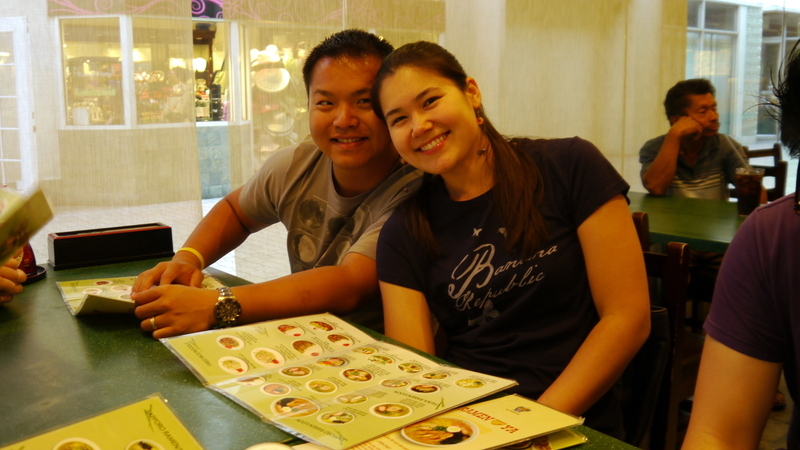 The newlyweds – still all smiles – decide what dinner to order. The food is what I might call “rough and tumble” – huge portions of moderately satisfying Japanese favorites. 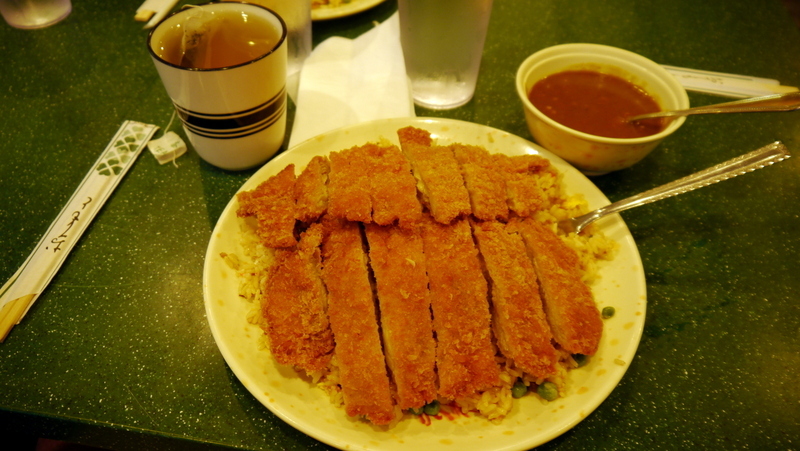 Here we have a gargantuan portion of chicken katsu served over fried rice. It was tasty enough but the portion could have served three. 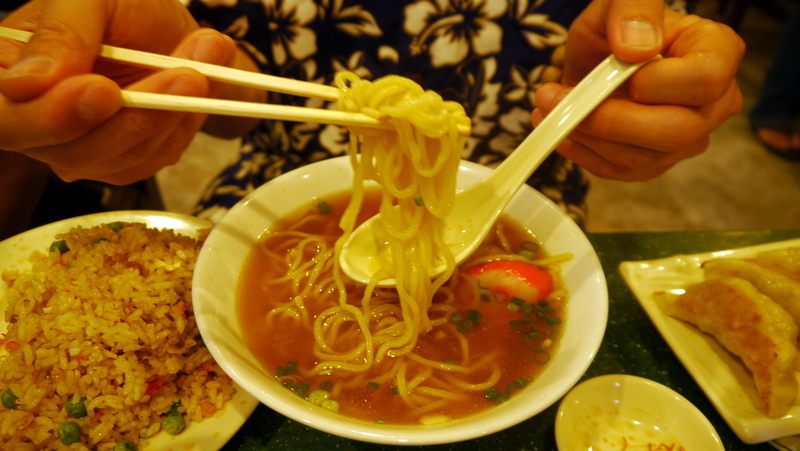 A bowl of ramen, part of a combo set that also included fried rice and gyoza. Nobody complained about the food but it didn’t inspire any positive raves, either. Andy Yang had arranged for all of us to make a trip to the Old Lahaina Luau, reportedly the best of the touristy package luau shows. Located right on the harbor, the grounds offered seating for more than 500 guests for their nightly show. The sun was a bit strong in the late afternoon but by the time it set, the location was beautiful and the weather pleasant. Each table seats eight – here is Andy Yang, his brother-in-law Erich, Sugi, and Tawn. Every group of three or four tables had their own server, all of whom were shirtless men. This was Tim, who was really friendly and took good care of our group. Would you believe he is celebrating his twenty-ninth wedding anniversary this year? He looks younger than that. Sunset over the harbor. 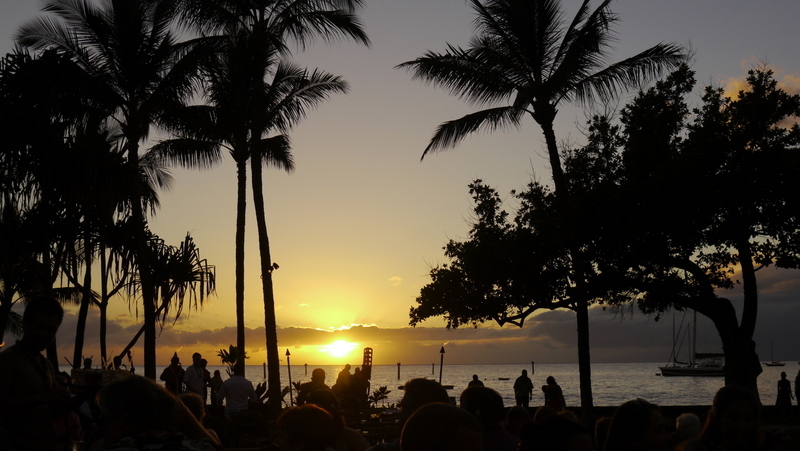 This was a beautiful sunset, accentuated by the live Hawaiian music being performed by a quartet on the lawn. Food was served buffet style, each table being released in order to avoid long queues. Food included Hawaiian specialties along with “Hawaiianized” chicken, steak, etc. On the left is lau lau pork – pork wrapped in ti leaves and steamed. 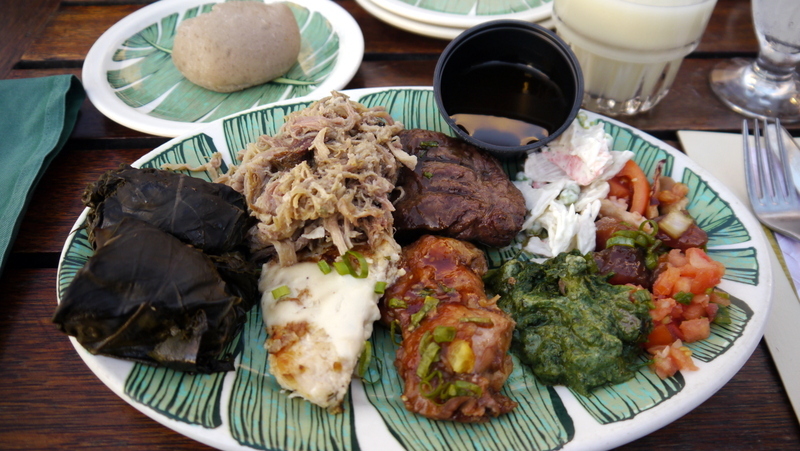 Working clockwise is kalua pork (which they cook overnight in a pit), teriyaki beef, a creamed vegetable salad, lomi salmon (a salted salmon dish), a dish made with local greens, sweet-and-sour chicken, and mahi mahi. Overall, I give the luau high marks for food quality and variety. Especially when considering the setting, the meal was very satisfying. 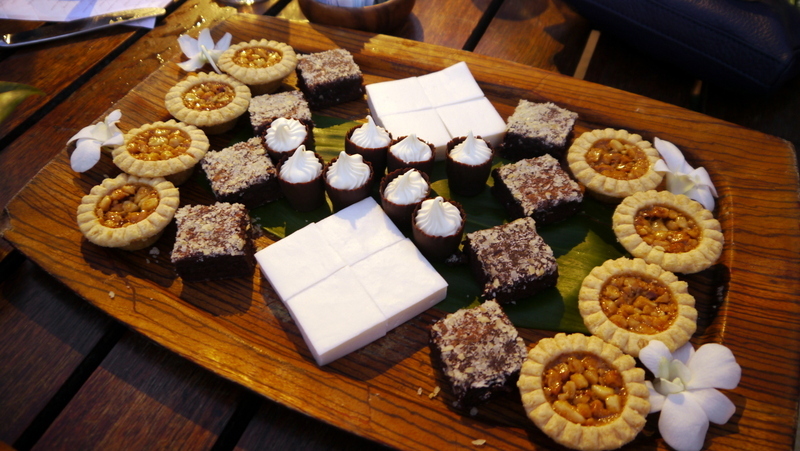 The dessert tray: macadamia nut tarts, chocolate brownies, chocolate passion fruit pots-de-creme, and haupia – a coconut milk based pudding. Two shots from the show, which came on after dinner. Photos by Andy Yang. 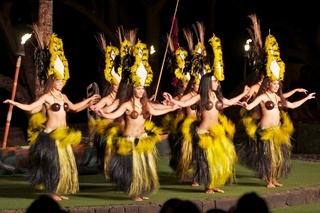 The program traced the islands’ history and illustrated different types of dancing based on different cultural traditions that influenced modern Hawai’i. 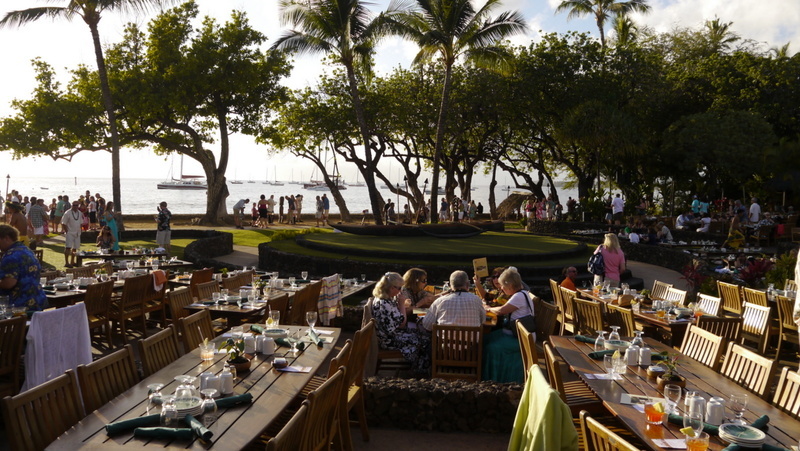 At $100 per person plus gratuity, the Old Lahaina Luau is steep. (All inclusive, including alcoholic drinks) If it is your first time to the islands, though, it might be a fun way to set the mood. Service was very good. A few days later we found ourselves back in Paia, where Sugi’s family lives. Andy and I tried sea kayaking (well, I tried, he photographed – more on that soon!) while Tawn did yoga. Afterwards, we stopped for some pizza at the renown Flatbread Company. 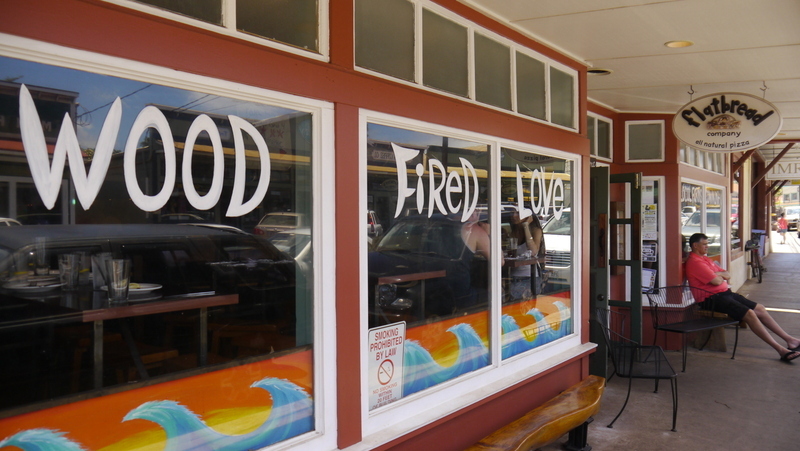 Here’s the storefront of the Flatbread Company, located in the hippie-ish town of Paia on the north shore of Maui. As the sign says, they serve wood fired love. In addition to the dough being made from organic flour, lots of ingredients are locally sourced. 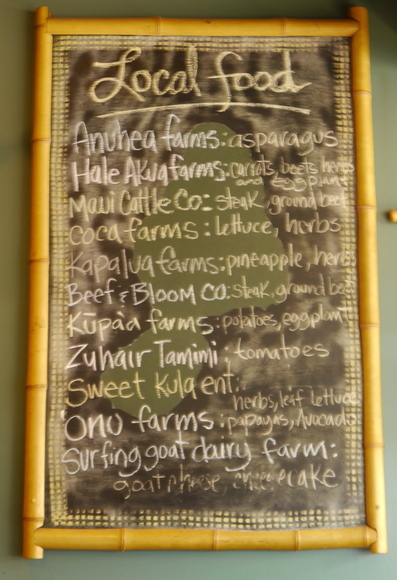 A chalkboard in the dining room lists local suppliers. The wood burning hearth is in the middle of the dining room. If you are feeling cold (not likely!) you can walk up to it and warm yourself. Metaphoto. Everyone is taking pictures. Thankfully, our dining companions knew the cardinal rule of food blogger etiquette: nobody eats until the shooting’s complete. 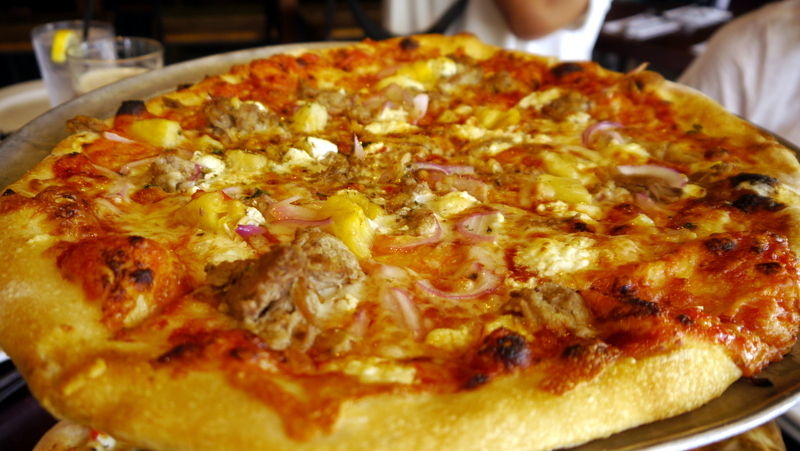 Mopsy’s Kalua Pork – Kiawa smoked free range pork shoulder, homemade organic mango BBQ sauce, organic red onions, Maui pineapple, and a blend of Hawaiian goat cheeses and mozzarella, topped with local organic herbs. 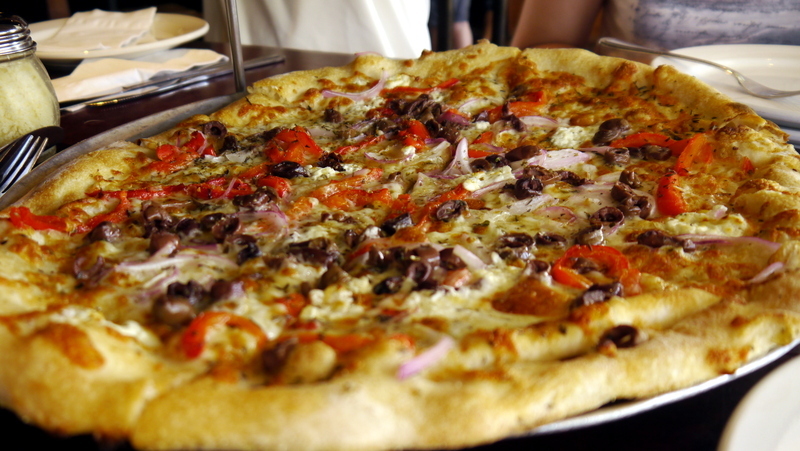 The Coevolution – imported kalmatta olives, fresh organic Maui rosemary, red onions, and fire roasted sweet red peppers, and a blend of Hawaiian goat cheeses and mozzarella, topped with organic local herbs. Both pizzas were excellence. The kalua pork was mutually agreed to be our favorite. What made these pizzas excellent were the crusts, that found the perfect balance between crispiness and chewiness. The secret – Giusto’s Organic Ultimate Performer Unbleached Flour from South San Francisco, which has high protein and high gluten. This entry was posted in Uncategorized and tagged Dining, Flatbread, food, Hawaii, Lahaina, Luau, Maui, pizza, Ramen, Restaurant by christao408. Bookmark the permalink. Nice photos. Nom nom poke and kalua pork!!! It all looks yummy and the newlyweds are so cute – all smiles! just starting to catch up on my xanga =P…the dessert tray looks absolutely amazing! I know you wrote about food but I all could remember was “…all of whom were shirtless men.” And then you tease us with a front view of those 2 dancers. 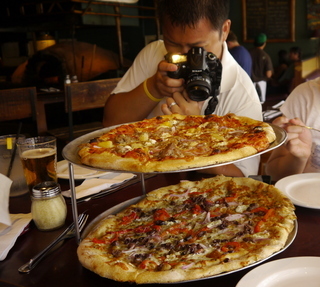 That kalua pizza looks awesome. I could use a couple of slices now with some cold Canadian beer. That second pizza is hunger provoking. Do you have a Canon camera Chris? Looks like what I have, but I am sure it is different from mine, because my photos never look any where as beautiful as yours do,Luau is fun. I enjoyed that a lot when we were there with children. It was a great experience for Saadia and Sayeed. 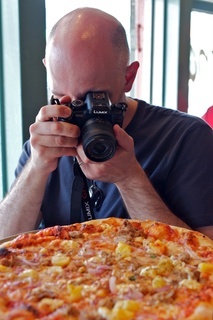 @ZSA_MD – @CurryPuffy – The camera is a Panasonic Lumix GH2, a mirrorless DSLR. I’ve decided to make the move to this larger camera primarily because it has excellent video shooting capabilities with a remote mic input. In fact, a friend recently shot a feature-length documentary using a pair of these cameras. While I miss the functionality and small size of my LX3 (and will keep it for certain situations) I hope that the GH2 will allow me to delve more into video production. @christine24666 – That’s the law these days, right? @Fatcat723 – They may be right, actually. There’s that slightly charred flavor where the bread is more caramelized than when baked in a conventional oven. @yang1815 – Yes, especially the ones you took. @Inciteful – Truthfully, pizza is one of those things that I don’t find the pictures quite as stimulating as other foods. But I’ll gladly eat it! @ElusiveWords – Had Tawn not been sitting next to me Matt, I might have been able to get more pictures for you of the servers. Sadly, I had to maintain the decorum of a married man. @jace1982 – What better place to start on your dip back into Xanga than a dessert tray? @grannykaren – @murisopsis – Glad you found the food tasty-looking. @christao408 - I see…. so did Andy get some pictures then? Chris, what a great post! If we do get back to Hawaii we will definitely get to Maui. Well, maybe anyway since we would like to see the Big Island also. @ElusiveWords – hehe no just the dancers! ramen is always yummy. just has some Hokkaido ramen yesterday for lunch. a newly opened ramen place in one of the malls here. n thanks to your pics, now i’m craving for some pizza. those two pizzas are making my mouth watered. @rudyhou – Ha ha ha… my plan has worked! I’m influencing your gastronimic choices! @Devilzgaysianboi – Oh, so much more than mixed plates. If it were just that, I’d have gained 20 pounds on the trip! @agmhkg – Sinful… and thus, good!